A werewolf (also known as lycanthrope or wolfman) in folklore is a person who shape-shifts into a Gray Wolf or wolf-like creature, either purposely, by using magic, or after being placed under a curse, often at the time of a full moon. Given that they were a threat to people, tales often focus on methods of revealing werewolves, protecting oneself from them, and killing them. While in contemporary times the werewolf is a staple of horror genres and role-playing games, the werewolf phenomenon can be traced all the way back to shape-shifting practices of shamans who transformed into animals including wolves. Some have suggested that diseases, such as rabies and porphyria, which cause symptoms that resemble some characteristics of wolves and also cause delusions, could be the origin of tales of werewolves. Werewolves can be seen as representing the duality of human beings as both animal and spiritual being. The animal nature is generally repressed, controlled by the human rational mind and social norms, but may be released when the moon transforms, concomitantly transforming the person. This darker side of human nature, uncontrollably aggressive and without morality, is unfortunately a reality. The transformation that we hope for, however, comes with the light of a new "moon," the light of true love, which will reveal the true goodness of human beings. The term werewolf is Germanic in origin. In Low German it is werwulf, becoming Werwolf in modern German. The original forms of the word directly influenced the Old English werewulf, and the Dutch weerwolf. The term "lycanthropy," meaning the ability of a human being to undergo transformation into a wolf or to gain wolf-like characteristics, is a combination of the Greek roots lukos, meaning wolf, and anthropos, meaning man. 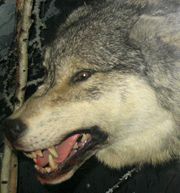 A stuffed Grey Wolf on display at the Patuxent Wildlife Research Center. Belief in lycanthropy goes back to early tribal societies. Shamans and witch doctors were believed to possess the ability to attune with nature to the point that they could transform into animals. Often these animals were quadra-pideal predatory animals, such as leopards, jackals, bears, coyotes, and wolves. Wolves in particular came to have a significant relationship with humankind—since humans domesticated the wolf into the household canine of today, an emotional connection was bridged between the species. Dogs, and by extension their wolf ancestors, are commonly regarded as kindred spirits, since the early days when they were used as hunting companions, to this very day when they interact with humans in a variety of ways. It is therefore not surprising that this animal, singled out by humans at some point in history, would come to be used in one of the most popular and consistent folkloric beliefs. For example, Inuit mythology includes the Adlet (also called Erqigdlet), a chimerical creature with the lower part of its body like that of a dog and the upper part like a man. The earliest accounts of werewolves come from Eastern Europe and the Mediterranean area. The Greek myth of Lycaon told of his transformation into a wolf as a result of eating human flesh. The Roman scholar, Pliny the Elder, quoting Euanthes claimed that a man of Anthus' family was selected by lot and brought to a lake in Arcadia, where he hung his clothing on an ash tree and swam across, resulting in his transformation into a wolf, a form in which he wandered for nine years. On the condition that he attacked no human being over the nine year period, he would be free to swim back across the lake to resume human form. According to Armenian lore, there are women who, in consequence of deadly sins, are condemned to spend seven years in wolf form. In a typical account, a condemned woman is visited by a wolf skin-toting spirit, who orders her to wear the skin, soon after which she acquires frightful cravings for human flesh. With her better nature overcome, the she-wolf devours each of her own children, then her relatives' children in order of relationship, and finally the children of strangers. She wanders only at night, with doors and locks springing open at her approach. When morning arrives, she reverts to human form and removes her wolf skin. The transformation is generally said to be involuntary, but there are alternate versions involving voluntary metamorphosis, where the women can transform at will. Werewolves in later European traditions were often innocent and God-fearing folk suffering from the witchcraft of others, or simply from an unhappy fate, and who as wolves behaved in a truly touching fashion, adoring and protecting their human benefactors. In Marie de France's poem Bisclaveret (1200), the nobleman Bisclavret, for reasons not described, had to transform into a wolf every week. When his treacherous wife stole his clothing needed to restore his human form, he escaped the king's wolf hunt by imploring the king for mercy, and accompanied the king thereafter. His behavior at court was so much gentler than when his wife and her new husband appeared at court, that his hateful attack on the couple was deemed justly motivated, and the truth was revealed. Other tales of this sort include William and the Werewolf (translated from French into English, 1350), and the German Märchen fairy tale, in which several aristocrats temporarily transform into beasts. For example, in Snow White and Rose Red the tame bear is really a bewitched prince, and in The Golden Bird the talking fox is also a man. The power of transforming others into wild beasts was attributed not only to malignant sorcerers, but to Christian saints as well: St. Thomas Aquinas believed that all angels, including those that had fallen, possessed the ability to manipulate matter; St. Patrick was said to have transformed the Welsh king Vereticus into a wolf; St. Natalis supposedly cursed an illustrious Irish family whose members were each doomed to be a wolf for seven years. Werewolf, by Lucas Cranach der Ältere, 1512. In Eastern Europe, particularly among the Slavic, Slovak, and Romani peoples, the idea of the werewolf evolved almost concurrently with the idea of the vampire. 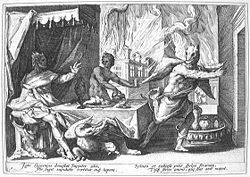 The belief in lycanthropy was prevalent in those areas, as was the belief in evil spirits of nature and Christian ideas of demons and the devil. As with vampires, people were capable of being overtaken by such spirits and entities, or were cursed for something they had done, and were transformed into werewolves. It is from these beliefs that the common conception of the werewolf comes. Some modern researchers have tried to use conditions such as rabies, hypertrichosis (excessive hair growth over the entire body), or porphyria (an enzyme disorder with symptoms including hallucinations and paranoia) to explain werewolf beliefs. Congenital erythropoietic porphyria has clinical features which include hairy hands and face, poorly healing skin, pink urine, reddish color to the teeth, and photosensitivity, which leads sufferers to only go out at night. There is also a rare mental disorder called clinical lycanthropy, in which an affected person has a delusional belief that he or she is, or has transformed into, an animal, but not necessarily a wolf or werewolf. Supernatural lycanthropy myths could originate from people relating their experiences of what could be classified as a state of psychosis. 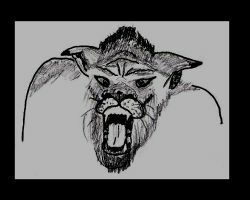 Drawing of a werewolf head. Historical legends describe a wide variety of methods for becoming a werewolf, one of the simplest being the removal of clothing and putting on a belt made of wolf skin, probably as a substitute for the assumption of an entire animal skin (which also is frequently described). In other cases the body is rubbed with a magic salve. To drink water out of the footprint of the animal in question or to drink from certain enchanted streams were also considered effectual modes of accomplishing metamorphosis. Olaus Magnus says that the Livonian werewolves were initiated by draining a cup of specially prepared beer and repeating a set formula. Ralston in his Songs of the Russian People gives the form of incantation still familiar in Russia. According to Russian lore, a child born on December 24 shall be a werewolf. Folklore and literature also depict a werewolf being spawned from two werewolf parents. An interesting distinction is often made between voluntary and involuntary werewolves. The former are generally thought to have made a pact, usually with the devil, and morph into werewolves at night to indulge in mischievous acts. Involuntary werewolves, on the other hand, are werewolves by an accident of birth or health. In some cultures, individuals born during a new moon or suffering from epilepsy were considered likely to be werewolves. The medieval chronicler Gervase of Tilbury associated the transformation with the appearance of the full moon, but this concept was rarely associated with the werewolf until the idea was picked up by fiction writers. Werewolves have several described weaknesses, the most common being an aversion to wolfsbane (a plant that supposedly sprouted from weeds watered by the drool of Cerberus while he was brought out of Hades by Heracles). Like vampires, werewolves maintain an aversion to religious artifacts such as crucifixes and holy water. One of the lesser known weaknesses is silver, as it was believed that a werewolf in human form would not transform when wearing a silver amulet. The repressive effect would be increased if the amulet were filled with wolfsbane. Stabbing a werewolf with a silver dagger was believed to revert the werewolf back to human form. In popular culture, a werewolf can be killed if shot by a silver bullet, although this was not a feature of the folk legends. 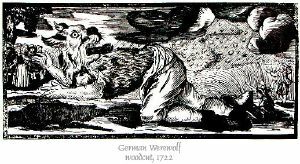 The general belief that silver can be used to defend oneself against a werewolf comes from the story The Beast of Gévaudan from 1764 to 1767. A magician named Jean Chastel blessed a silver bullet with which he seriously wounded the werewolf. It should be noted that some researchers believe the "silver weakness" is a mistranslation of "silvered metal" which actually refers to quicksilver (mercury), an injection of which was deemed fatal to werewolves (and of course, to other living beings). However, because silver and the naturally nocturnal wolf are both associated with the moon, the "silver weakness" has endured. Various methods have existed for removing the werewolf form. The simplest method was the act of the enchanter (operating either on oneself or on a victim) and another was the removal of the animal belt or skin. To kneel in one spot for one hundred years, to be reproached with being a werewolf, to be saluted with the sign of the cross, or addressed thrice by baptismal name, to be struck three blows on the forehead with a knife, or to have at least three drops of blood drawn have also been mentioned as possible cures. Many European folk tales include throwing an iron object over or at the werewolf, to make it reveal its human form. Becoming a werewolf simply by being bitten by another werewolf is common in modern fiction, but rare in legend, in which werewolf attacks seldom left the victim alive long enough to transform. Werewolves have long been as popular a subject of horror and gothic works of fiction as vampires, both mistakenly assumed to be Eastern European creations, particularly in the late nineteenth and early twentieth centuries. 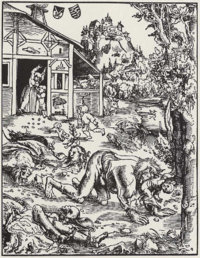 Depictions almost exclusively involve lycanthropy being either a hereditary condition or being transmitted like an infectious disease by the bite of another werewolf. The process of transmogrification is often portrayed as painful in film and literature. The resulting wolf is typically cunning but merciless, and prone to killing and eating people without regret regardless of the moral character of its human counterpart. The form a werewolf assumes is not always that of an ordinary wolf, but often anthropomorphic or otherwise larger and more powerful than an ordinary wolf. Many modern werewolves are supposedly immune to damage caused by ordinary weapons, being vulnerable only to silver objects (usually a bullet or blade). This negative reaction to silver is sometimes so strong that the mere touch of the metal on a werewolf's skin will cause burns. More recently, the portrayal of werewolves has taken a more sympathetic turn. With the rise of environmentalism and other back-to-nature ideals, the werewolf has come to be seen by some authors as a representation of humanity allied more closely with nature. Some recent fiction also discards the idea that the werewolf dominates the mind when one transforms, and instead postulates that the wolf form can be "used" at will, with the lycanthrope retaining its human thought processes and intelligence. A popular theme in werewolf literature is the metaphor of the werewolf as the duality for human nature; the wolf is sometimes seen as the wild animal that exists in all humans but is kept in check by the human, rational aspect. The full-moon transformations are symbolic of times when humans revert back to their primal roots. Sometimes the symbolism is not connected to nature, instead representing the darker side of humankind that some suggest lives in everyone, but is normally suppressed by social constraints and morality. ↑ The Oxford English Dictionary. (Oxford Press: Oxford, 1971, ISBN 019861117X). ↑ Franz Boas, Race, Language, and Culture (University of Chicago Press, 1982, ISBN 9780226062419), 512. ↑ Edith Hamilton, Mythology. (Back Bay Books, 1998, ISBN 0316341517). ↑ Mkhitar Gosh, The Fables of Mkhitar Gosh. (New York, 1987, ISBN 0935102213). ↑ 5.0 5.1 5.2 Transformations (Time-Life Books, 1989, ISBN 0809463644). ↑ 6.0 6.1 Aaron Bennett, “So, You Want to be a Werewolf?” Fate. 55(6), Issue 627, July 2002. ↑ Elliott O'Donnell, Werewolves. (Kessinger Publishing, 2003, ISBN 0766177521). ↑ Montague Summers, The Werewolf in Lore and Legend. (Dover Publications, 2003, ISBN 0486430901). Prieur, Claude. Dialogue de la Lycanthropie: Ou transformation d'hommes en loups, vulgairement dits loups-garous, et si telle se peut faire. Louvain: J. Maes & P. Zangre. 1596. Wolfeshusius, Johannes Fridericus. De Lycanthropia: An vere illi, ut fama est, luporum & aliarum bestiarum formis induantur. Problema philosophicum pro sententia Joan. Bodini ... adversus dissentaneas aliquorum opiniones noviter assertum... Leipzig: Typis Abrahami Lambergi. 1591. All links retrieved November 27, 2015. This page was last modified on 27 November 2015, at 16:36.